My household is divided when it comes to eating. My husband is a picky eater and me and the girls eat every thing and vegetable, you name it! Being so busy takes the fun out of cooking but often I try to prepare a dish that he will actually eat. 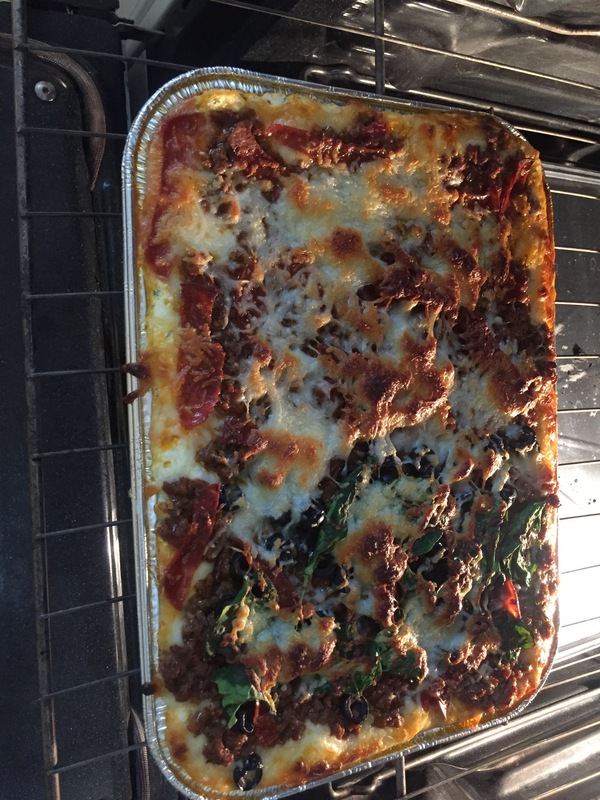 Today he asked for lasagna…. I decided to make love by making it from scratch. It’s the little things that I do for my partner that bring me joy. In a skillet, combine 2 pounds ground beef, garlic salt (or 2 cloves minced garlic), and pepper . While the meat is cooking, mix 3 cups lowfat cottage cheese in a bowl with 2 beaten eggs. Add a 1/2 cup of Parmesan cheese into the mix. 2 tablespoons dried parsley flakes and a teaspoon of garlic salt. Mix together well. Now, go ahead and build your assembly line: meat mixture, shredded mozzarella cheese, cottage cheese mixture, and lasagna noodles. Cottage cheese mixture spread over noodles evenly, next shredded mozzarella spread evenly; last layer, spread meat mixture evenly. Top with Italian shredded cheese, pepperoni slices, black olives, spinach, and more Italian shredded cheese. Let back for 30 to 35 minutes on 375-400 degrees. Thank you for visiting & commenting! You’ll love it.